ATC Semitec stock a full range of motor protection PTC thermistors with temperature switch points from 60°C to 190°C in 10K steps. At its thermal switching point (Ts), the PTC resistance increases dramatically from a few hundred ohms to several thousand ohms over a few degrees. Thus the PTC acts as a solid-state thermal switch and so can trigger an electronic circuit used to switch off an over-loaded electric motor, over-heated bearing or electrical appliance. Colour-coded 26AWG PTFE leads ensure compliance to the DIN44081 standard and 3-phase motor triplet versions to DIN44082. Owing to their very low cold impedance and step-function PTC characteristic, several motor protection PTCs can be wired in series so that multiple points (i.e. 2 or 3 motor phases) can be monitored at the same time – any one over-temperature condition triggering a motor protection relay circuit and thus thermally protecting the motor. Call our experienced team to discuss our full range of PTC thermistors. The TPM series of SMD PTC thermistors are frequently used as thermal switches in electronic circuits. Their small size (0402, 0603 or 0805) and step change RT curve (at their trip point) makes these solid-state temperature switches ideal for small spaces and are very simple to incorporate. Temperature switch points from 65°C to 135°C are available with several R25 (resistance at 25°C) values to suit varying circuit conditions. 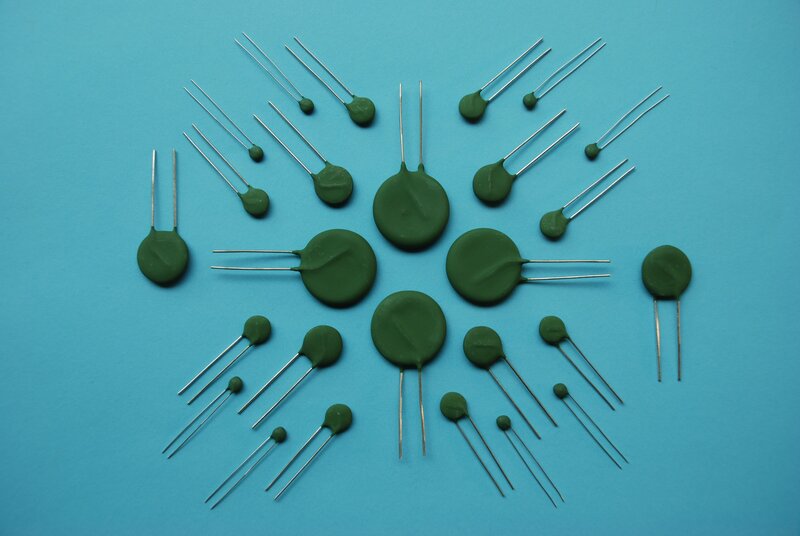 Ceramic PTC thermistors are often used as re-settable current fuses as they offer several benefits over conventional fuses. Over-voltage or over-current conditions cause the PTC thermistor to “switch” from a low resistance to a high resistance state, effectively limiting (switching off) the through current. The PTC acts as a current fuse and protects the electronic circuit, electrical appliance or series load. Often simpler to incorporate in a circuit than a current fuse, PTC fuses also don’t need replacing and thus help to minimise service calls when nuisance tripping is caused by various transient surges. By applying a voltage across a PTC thermistor, current will flow and begin to heat the PTC material. The PTC element rises in temperature until it reaches its Curie point, when its resistance will increase exponentially. 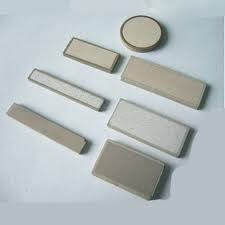 The increase in PTC resistance limits the through current until the PTC heater reaches a state of equilibrium. If heat is withdrawn from the PTC, its resistance will drop allowing more current to flow through the PTC until a steady-state condition is reached again. Conversely, if the PTC element temperature rises, its resistance will increase accordingly reducing the through current until a further state of equilibrium is achieved. Thus a PTC thermistor can operate as a self-regulating heater.